In this essay, a comprehensive history of Dewey’s Tavern in Champlain Town will be given. The tavern has stood for over 209 years and it and the original log cabin are some of the oldest buildings in the town still standing. 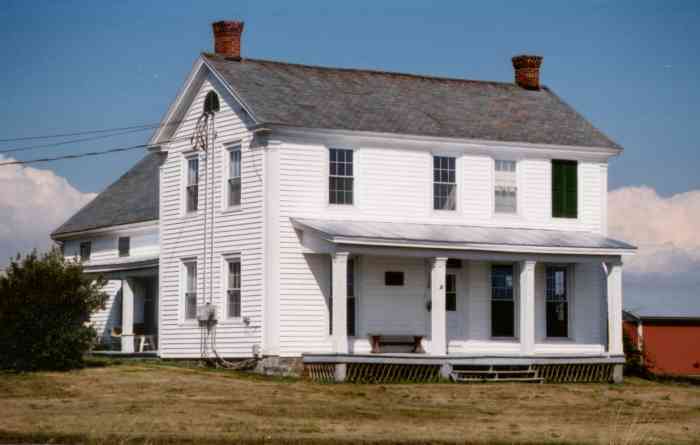 Built by one of Champlain’s original settlers, it was occupied during the War of 1812 by both American and British troops and is known today as one of Clinton County’s most historic houses. The nearby Dewey family cemetery is the final resting place of the extended Dewey family as well as many American and British soldiers who died during the war. 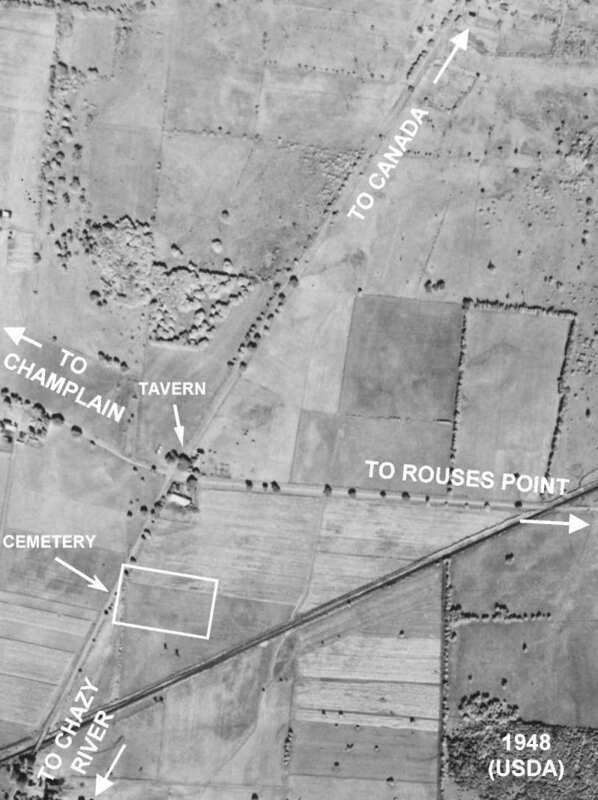 It is the second most important military burial site in the Town of Champlain. Dewey’s Tavern is situated at the corner of Route 276 and Prospect Hill Road roughly halfway between the villages of Champlain and Rouses Point. The tavern is less than two miles south of the border on the original route that connected Albany with Montreal. The story of Dewey’s Tavern starts in the year 1797 with the arrival of Elias Dewey and his family. Elias was born in Hebron, Connecticut on April 26, 1768, and died in Champlain on January 11, 1854. He married Lovisa Hamilton (July 29, 1773-May 19, 1846). She was born in Massachusetts and was the daughter of John Hamilton and Sarah Stone. Elias, with his wife and four children, may have left Wethersfield, Ct, (or Willsboro, NY as another source suggests) in 1797 and came to Champlain via Whitehall in the sloop called the “Drowning Boy”. It took about a week to make the 100 mile trip. As early as 1793, the intersection (later called Dewey’s Corners) that Elias Dewey built his house at consisted of three roads. One road led to the village of Champlain over the Great Northern Turnpike (now Prospect St.). This road extended to the Canadian border only a short distance away and was the main road to Odelltown and Lacolle (this road would see many skirmishes on it between 1812 and 1814). Another road extended from this corner down to the “Rapids” at the Great Chazy River (south on Route 276 to Mason Road and to the river). A third path had been cleared to Rouses Point but Elias had to re-cut it when he arrived. He hired an ox team to move his belongings from Rouses Point to Champlain. It should be noted that many of these roads were likely little more than glorified trails through the woods, especially the road to Rouses Point that Elias re-cut. The Champlain Town settlement was only nine years old at the time of Elias’s arrival. Pliny Moore, the founder of Champlain, had arrived in 1788 with settlers for his Moorsfield Grant. He built a sawmill on the Great Chazy River near Perry’s Mills and later built a frame house in 1801 at the site of the present Clark Funeral Home in Champlain. Many other settlers had arrived since 1788 and had purchased lots out of the Moorsfield Grant or from the Canadian and Nova Scotia Refugee Tract that surrounded the Moorsfield Grant. Elias Dewey purchased Lot 104 of 80 acres from John Hamilton in the Refugee Tract. This land directly bordered the east side of the Moorsfield Grant. Although a sawmill existed in Champlain, Elias chose to build a log house using logs that were hand hewed with a broad axe and adze. His family lived in this log house for two or three years. Drusilla Dewey, Elias’s daughter, was told that a blanket was placed over the front door to block the cold winter wind from entering the dwelling (later a more permanent door was made). From the look of the cabin today, it is apparent that it was little more than a wind shelter. Heating it in the dead of winter would have consumed vast amounts of timber as well as time to cut and split the wood. Life during this time was surely difficult for the entire family. 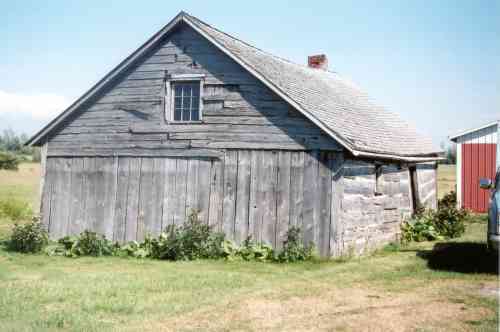 Today, the log cabin still exists and is one of the oldest buildings in Champlain. In the 20th century, it was used as a shed and pigsty. Its hand-hewed timbers and dovetailed corners are still clearly seen 212 years later. The War of 1812 started on June 18, 1812, after Congress declared war with England. The 2006 Champlain Historic Calendar essay detailed the overall events surrounding Champlain’s occupation by American and British troops during the war. Hence, only the events that occurred at or near Dewey’s Tavern will be the focus here. Throughout the entire war, the Village of Champlain was susceptible to incursions by the Canadian militia, British troops and the St. Francis and Caughnewaga Indians employed by the British army. Numerous skirmishes would take place between Dewey’s Tavern and the border on the Route 276 road as well as on the hill of upper Prospect Street. Many of Champlain Town’s residents were in “perpetual fear” during the war due to their exposure to the border. At the start of the war, only 150 men in Champlain were capable of bearing arms and only 15 actual arms were to be found. This lack of protection made some families leave town never to return. The price of goods and services rose and the poor were severely impacted. The stages and steamboats to Rouses Point stopped their trips to the area. Religious services were suspended for three years as traveling missionaries avoided the town. Worship was held by Pliny Moore and Jehudi Ashmun at Pliny Moore’s house. Between March and August of 1814, many skirmishes occurred in the fields off upper Prospect Street (at the top of the hill where the water tower is today) and along Prospect Street from the hill to Dewey’s as well as along Route 276 to the border. The skirmishes of June 21 and June 28 deserve mention here as they were close to Dewey’s Tavern. On this date, Col. Benjamin Forsyth, along with 70 of his Riflemen and Lieut. Hamilton and Lieut. Bennett Riley had a skirmish with 200 troops under British Captain St. Valier Mayhew (variously spelled Mailloux, Mahew and Mayo). (Lieut. Riley entered the army in 1813 and served in the First Rifles. By 1849, he was a general and provincial governor of California. Fort Riley and a county in Kansas are named after him.) The troops consisted of Canadian militia and the St. Francis and Caughnewaga Indians. In the first skirmish, Forsyth’s men crossed over the line before being discovered and surrounded by enemy troops. They retreated back to Hamilton’s house and took refuge inside and in the outbuildings as they were surrounded. During the firefight, the house was bombarded with shot. In May of 1814, General Izard was placed in command of the northern army. In July, he had over 4,500 soldiers in Champlain who were camped on the hill overlooking St. Mary’s Church. On July 25, Pliny Moore wrote in his diary that “A man had been shot for desertion.” The two other soldiers who were part of this desertion pact were shot at with blank cartridges and fell to the ground in a total state of fear but where unhurt. One of the causes of the War of 1812 was the British conscription of seamen sailing on American merchant ships. The British believed that “once an Englishman, always an Englishman”. Many hostages and prisoners were captured on both sides. With so many captives being taken, the American and British governments wanted to negotiate an agreement for the exchange of prisoners. On November 28, 1812, the first agreement was signed between the Americans and British for the exchange of prisoners. Later, another agreement was made by British agent Thomas Barclay and John Mason. By January of 1814, American Brigadier General John Winder was paroled and sent to Washington to propose another agreement for the exchange of prisoners of war. On December 27, 1815, a stage coach was established between Montreal and Plattsburgh. The coach made two weekly trips and stopped at inns in Montreal, La Prairie, Champlain (at Dewey’s Tavern) and Plattsburgh. In a legal notice in the Plattsburgh Republican of 1815, the tavern was called the “Elias Dewey Inn”. Another big event for the family occurred in 1816. On July 24, 1816, Elias and Lovisa had their last child (the previous one being born only two months prior to the outbreak of the war in 1812). Elias and Lovisa Dewey had 13 children. They were Lovisa (1791-1812); Samantha (1792-1866) who married Oliver Odell of Odelltown; Elias Jr. (1794-1876) who settled in Malone in 1823 and whose descendents, including Elias IV, are buried; Sabra (1797-died young? ); Cynthia (1799-?) who married Hosmer Corbin and had five children named Joseph Elias Corbin, Louise Hamilton Corbin, Amelia Sailly Corbin, William Tallmadge Corbin and Florence Corbin. Hosmer was related to Pliny Moore’s wife, Martha Corbin. Another child of Elias was Almyra (1802-1897) who married a Dr. Sawyer in Keeseville; Drusilla (1802-1879) a twin who was unmarried but living with her father Elias in 1850 (he died in 1854) and then her brother Silas; Susanna (1804-1804) twin; Sylvanus (1804-1809) twin; and Silas Hamilton Dewey (1810-1884) who married twice and lived at the Dewey Tavern until his death in 1884. He had a daughter named Elizabeth around 1850 (her genealogy was noted earlier as she was the last Dewey to have owned the tavern; she married George Barber of Plattsburgh). The second to last child born was Sara Maria (1812-1854) who married Charles Sailly Moore (1804-1882). Charles was the son of Dr. Benjamin Moore and was a nephew of Pliny Moore. Maria, as she was known, died seven days after giving birth to her eighth child named Charles Jr. in 1854 at the age of 42 (her previous child was born nine years earlier). Charles and his children then moved to Yreka, California between 1854 and 1856 during the gold rush and this is where he and his family are buried. The last child of Elias and Lovisa was Emily Lovisa (1816-?) who married Moses Baxter and moved to Chicago. A few children did not survive to adulthood (one may not be mentioned above). The Dewey family cemetery, described to be about one acre in size, is south of the Dewey house and across from the school. 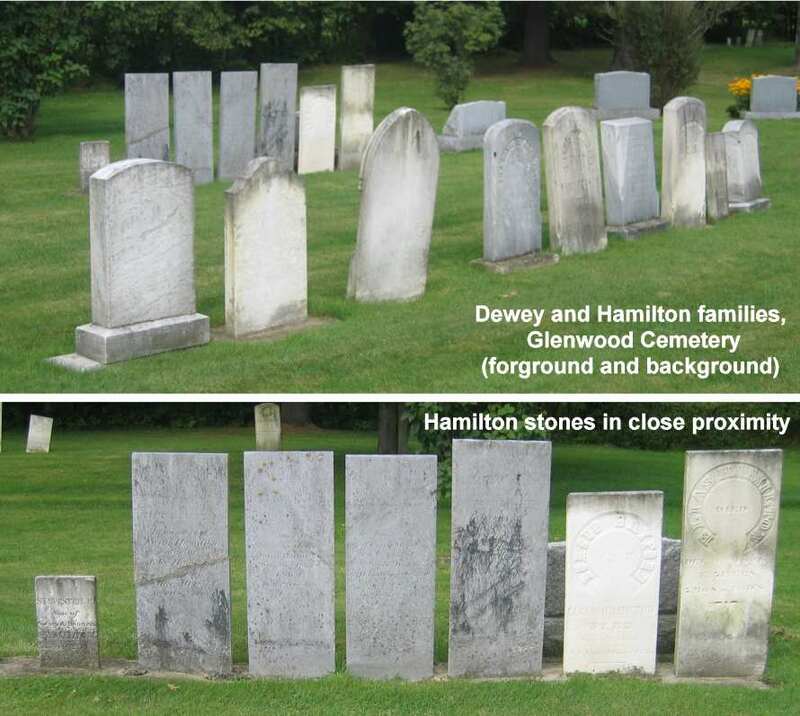 The cemetery likely contains the remains of the Dewey, Hamilton, Odell, Newell, Kingsley, Moore and Twiss families. American soldiers serving in the War of 1812 who died after the LaColle stone mill siege of March 1814 were buried here. Tradition states that British soldiers who were wounded in the Battle of Plattsburgh were cared for at the tavern, and when they died, they were buried in the cemetery. The cemetery was placed in the elevated area of the south field in the sandy section. This location made it easier to dig graves. Most of the corn field has rock ledge below the surface and other areas of the field are low and flood in the spring. Today, no trace of the Dewey family cemetery exists and it is impossible to determine the exact location of the main burials. Only the cemetery driveway over the ditch by the road is present. Local legend states that the cemetery stones were gradually removed over time by a farmer in the early 1900s and some of them may have been thrown into the newer part of the barn that burned down in 1973. No one knows if this is true, though. Mr. Bedard says his father remembered seeing the cemetery and that he only remembers seeing the cemetery’s iron gate years later. 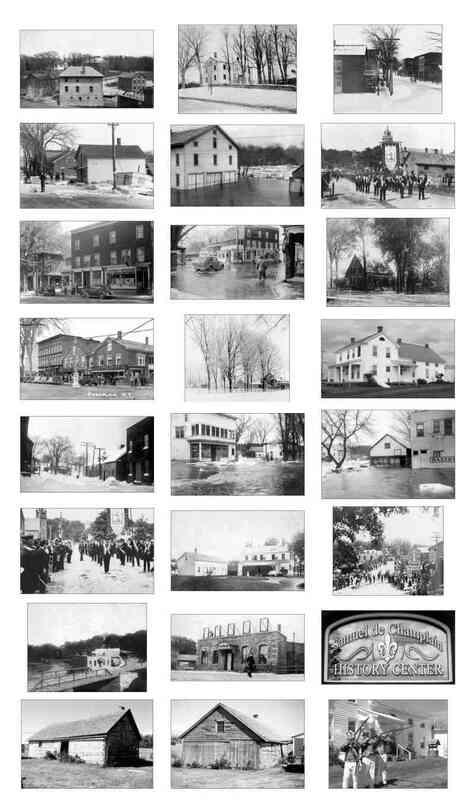 Images courtesy Special Collections Library, Plattsburgh State University College, the Clinton County Historical Association in Plattsburgh, New York or the author.